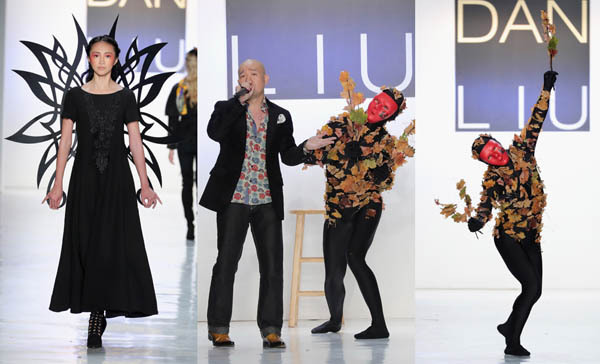 Dan Liu is developing a reputation for putting on a show at New York Fashion Week and this season he outdid himself; Modern dance, a George Michael tribute, a model fairy, and as always beautiful fashions all took center stage at Dan Liu’s Fall/Winter 2017 runway show. Lui , dubbed the ‘King of the Cocktail’ dress, presented a fall collection complete with tweed coats, knit dresses and vibrant silk scarves teeming with wearable pieces. The full house of chatter came to a hush and the runway went dark and from the darkness the magical whimsy began as modern dancer, Irakli Shengelia, performed for guests with an interpretive dance. The fashion picked up on the fall theme pulling out the red tones of foliage as a model sashayed down the runway in a vibrant red floor-length coat. The red hues continued and slowly transitioned into graphic printed, color blocked, and structured cocktail dresses that were expertly tailored. Liu’s designs all featured intricate and unexpected details elevating each look such as a “pop-art” anime detailed collar peeking out of a black double-breasted pea coat. The collection contained a mix of mod silhouettes, dresses and coats with classic feminine European styling that one could imagine on the likes of Kate Middleton. Looks included vibrant silk scarves and bold hued shoes by Liliana Shoes that accentuated the versatility of Dan Liu’s designs. The evening ended with a true surprise for the audience complete with a finale tribute to George Michael where the designer himself sang “Kissing a Fool” while a modern interpretive dancer in a morph costume covered in autumn leaves danced around the runway in true theatrical fashion. Notable attendees included Dorothy Wang and Bianca Espada from The Rich Kids of Beverly Hills, Jersey Shore’s Sammi Giancola. Miss USA – Deshuana Barber, Miss Universe – Iris Mittenaere, and Serbian Singer Didi J. Both labels often appear with knit, crochet, lace, embroidery and beaded details, and are favored by young executives as its chic yet elegant apparel can be worn from day to night. As Designer-in-Chief, Dan is best known for contemporary dresses and his tailoring that accentuates the female form with a romantic flair. Dan’s versatility can be seen from various themes of his collections. Working from concept to patterns, he incorporates color contrasts, details and wearability to ensure every piece is perfect from any angle.